Between 2011 and the end of 2014, bond prices were also on the up; although since then government bond prices in general have tailed off. In addition to QE, several central banks have embarked on zero-interest-rate, or even negative-interest-rate, policies in a forlorn attempt to promote consumption, through cheap borrowing. The problem with this policy is that it was private debt which was a major contributor to the global financial crisis in the first place. In fact, whilst public debt levels seem to gain governments’ concentration, they are dwarfed by private debt. In the context of global economic performance – certainly in the form of stagnant GDP amongst the G7 countries, as well as Australia – all this means that assets are hugely overpriced and there is still a mass of household debt. 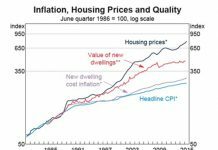 What these economic conditions mean in terms of Australian property prices is that there prevails a global context of overvalued assets and piles of debt. Consequently, attempts to deflate the bubble gently will likely face a pushback. 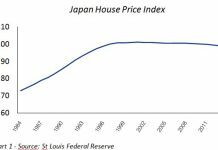 In the years after the GFC, many countries have seen some deleveraging of that debt and this has, in some cases, been apparent in a drop in house prices. 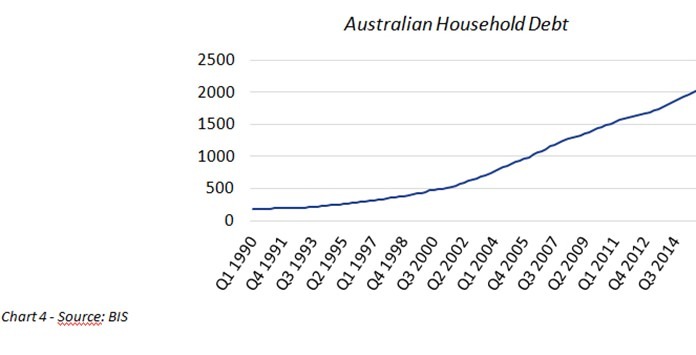 But Australia hasn’t followed this trend: the housing boom has instead carried on and on. 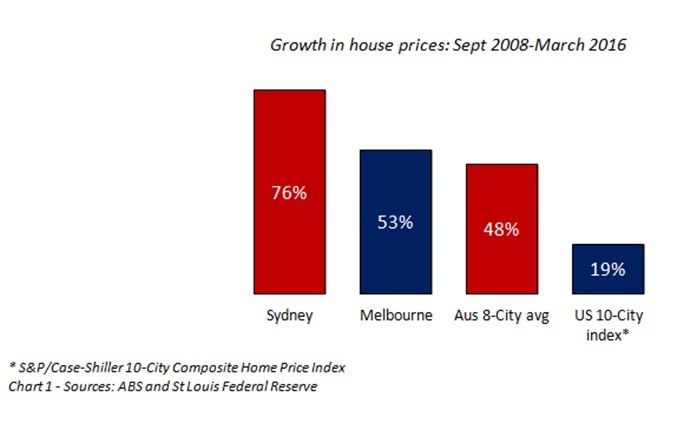 Sydney and Melbourne in particular have experienced huge rises in prices since autumn 2008: 76% and 53% increases respectively (see chart 1). 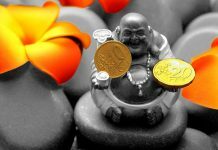 Such debt-fuelled growth is a repetition of the run-up to many of the great crises of the past: not least the US sub-prime crisis which led to the GFC.2 However, there seems to be a feeling in Australia that they are the exception to the rule – and with it come a range of excuses to support a visibly over-valued market. One reason given for why everything is just fine down under is population growth, due to a large number of births and immigration.3 This is curious because new-born children don’t generally buy houses and many new immigrants would surely rent, whilst establishing themselves in the country (see chart 2). Not only that, China continues to be Australia’s top export market. In 2014-15, around 32% of exports crossed the China Sea and just over 14% of Australian services were delivered in China. Also, 45% of Australia’s total exports comprised of minerals and fuels. Having all of your eggs is so few baskets is always risky. 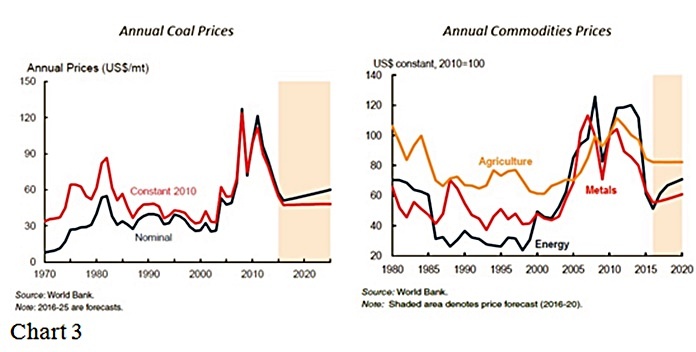 Given the concerns and uncertainties over the Chinese economy,6 as well as a massive drop in mineral and fuel prices in the last two years or so,7 it’s extremely dangerous (see chart 3). The other excuse for overvaluation that really caught my eye was the assertion that there is a “healthy level of household debt.”11 Even the most hardened optimist has to admit that such a massive increase in such a short time (see chart 4) can in no way be deemed to be healthy. Icebergs ahead! All head full!